Chafe protection is critical at the dock, at anchor, or on a mooring. The Chafe Guard is a good solution to prevent chafing over a cleat, cap rail, where two lines cross or at the anchor roller. Dock lines can be expensive; extending their life with good chafe protection is not. Removable Chafe Guards fit 3/8" to 7/8" line (10 mm to 23 mm). 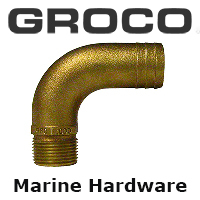 Great for anchor lines or mooring pennants, where chafing through a line could cost you the boat. Velcro® brand hook fasteners on the inside of the guard grip the line securely; no need for additional strings or ties. Easily reposition when dock lines stretch and chafe protection needs to moved. Made of nylon. Sold by the pair. Each chafe guard is 16" long (40 cm).